A film by Mona Rathsman (Eroles Project) with special thanks to all the participants on the Emerging Politics residency. "What are our reasons for taking action, and what are our brakes?" This is a question that came up for Anna, one of the 10 people from across Europe that gathered in a house in Catalonia, to explore Emerging Politics. What does taking action mean in our personal, politic and civic lives? When and where is it happening? How do we bring more awareness to out own patterns of participation? This short video documents some reflections from participants who joined an Eroles Project Residency on Emerging Politics during summer 2017. What about you? What are your reasons for taking action, and what are your brakes? What does taking action mean in your personal, politic and civic life? When and where is this happening for you? How might you bring more awareness to your own patterns of participation? This is the third blog from Eroles project, read ‘Eroles Project – Deepening Citizenship’ and ‘Our arrival to Politicking’. Check out their soon-to-be-updated website to find out more about the Eroles Project, our summer residencies and our migration-focused regeneration project in Granada, Spain. 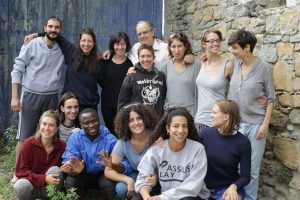 Eroles Project works to create the conditions for personal and political change towards a sustainable and equitable world, through building an active community of changemakers, designing projects and hosting residencies. These annual residencies set amidst the mountains of the Spanish Pyrenees provide the context for rich dialogue and inner transition, enforced by creativity, community living and the design of a collective project. During and after the residencies, our active community support one another to dare to step into making the changes we feel are needed; to have the courage to be response-able to the world around us. With an emphasis on community, complexity and action learning, we design projects with our core values at the heart – focused on inner learning for outer action. Our previous years’ themes Climate Justice and Borders led to a community hub of artists and activists in Paris – reimagining activism alongside COP21, and now Regeneration Project: Granada – regenerating lives and land in a village in Southern Spain. Supported by a core team of four – Mona, Ally, Ruth and Maria, we are a growing collective of people with diverse backgrounds and interests. Our contribution to the Transition Network blog will be to bring alive the topic of Democracy; exploring the question of how to “be” political. Following this year’s residency, the blog will explore what is meant by the political realm, share emerging forms of political and social practices taking root around the world and seed reflection on how we can each step up to act.